The number one way to get rid of fleas is to vacuum on a regular basis, but it's also important to wash bedding thoroughly and to use products with growth inhibitors. Stop fleas from entering into their adult stage with help from a certified pest control operator in this free video on pest control. Hi friends, I'm Mark Govan here with ABC Pest Control in Largo, Florida, and I've been asked a question, how can you safely get rid of fleas in your home? Well, fleas can be a real bad problem inside the house, but number one, is vacuuming your carpets on a regular basis. That can help eliminate almost 90 percent of the population of fleas within the home. The next thing is to concentrate in the bedding material if you have an animal, look at the bedding material and make sure you wash that very thoroughly, and then have your dog or cat, take them to the veterinarian and dipped for fleas, that will take care of another source. If the fleas do come back there's a couple of things you can do as a homeowner. Number one, using products with Precor in them. 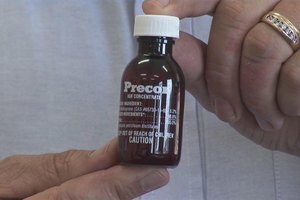 Precor is a growth inhibitor for fleas, it stops the fleas from actually developing into the adult stage which bites you. You mix this up in a gallon of water, you spray it out, and it's kind of like birth control for fleas, it stops them from developing, and will keep you free of fleas for over six months, so it's a great product to use. Another product, if you didn't want to get that, we have a new product called Precor 2000, which actually contains Precor right here. Very, very easy to use, you just shake up the bottle, open it up and you spray it directly at the floor and this will keep the fleas out of your entire house again for two to three months at a time. So all of these products are very good, very easy to use and very effective. Just don't forget, vacuuming will get rid of 95 percent of them, the balance of the fleas leave to the chemical products or have a professional treat it. I'm Mark Govan with ABC Pest Control in Largo, Florida, hoping you have a pest-free day.